The update is available via Apple's software download webpage, Software Update for those under OS X Lion and via the Mac App store for those with OS X Mountain Lion installed. And this is why I don't buy brand-new stuff. because you get cool new features with them? Holy crap! I just applied the update and the fans spinning up to maximum scared the crap out of me! I'm filled with regret every time I gaze into the beautiful display of my rMBP. Luckily I can keep the lid closed while it does awesome **** for me now. And this is why I don't buy brand-new stuff. It's better to just wait a little for all of the fixes. Umm... This is not a fix. This is a firmware update that enables Power Nap. 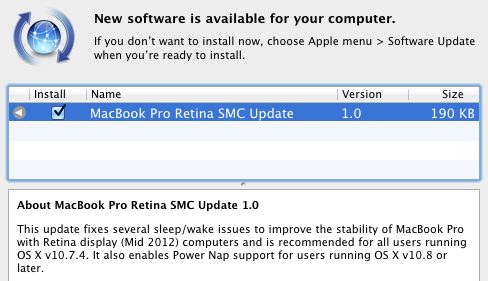 It doesn't matter when you upgrade to Mountain Lion, you'll still have to update your firmware to use Power Nap. If anyone has any thoughts or has a similar issue, please respond to that thread. Maybe try disabling all that extra crap you have running first. It relies on hardware to support this feature... so... long.